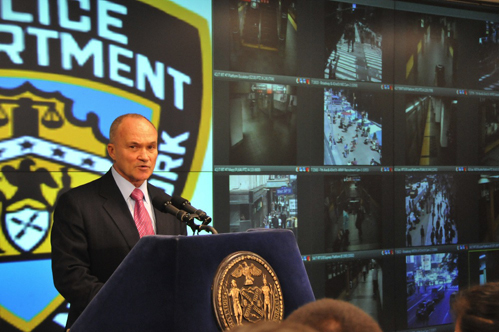 Commissioner Kelly, Mayor Bloomberg and MTA Chairman Walder announced the addition of subway cameras to the Midtown Manhattan Security Initiative, inside the Lower Manhattan Security Coordination Center on Monday. Mayor Michael R. Bloomberg, Police Commissioner Raymond W. Kelly, and MTA Chairman and Chief Executive Officer Jay Walder today announced the activation and integration of approximately 500 subway cameras in Times Square, Penn Station, and Grand Central Station into the Midtown Manhattan Security Initiative, an expansion announced last October which builds on the Lower Manhattan Security Initiative conceived by the NYPD in 2005. When complete, the Lower Manhattan and Midtown initiatives will cover parts of the City’s major centers of finance, commerce and government, transportation hubs and iconic landmarks, including the World Trade Center, with a network of CCTV cameras, license plate reader technology and radiation detection sensors that feed into and are monitored through the Lower Manhattan Security Coordination Center. The MTA cameras make up the majority of 689 cameras between 30th Street and 60th Street that currently feed into the Lower Manhattan Security Coordination Center. As of this month, the program includes a total of 1159 public and private-sector cameras, including those covering Lower Manhattan assets south of Canal Street. When it is complete, the Lower Manhattan and Midtown initiatives will include approximately 3,000 cameras. MTA and NYPD ARGUS and Department of Transportation cameras (right) feed live video into the Lower Manhattan Security Coordination Center. "The safety and security of our customers is the MTA's top priority, and I am thrilled to partner with Mayor Bloomberg and Commissioner Kelly to keep customers safe at our busiest transit hubs," MTA Chairman and CEO Jay H. Walder said. "Today we also see the impact of the MTA's new approach to implementing technology projects, with more than 1,400 cameras activated in the past six months alone. With the right focus we can make technology work for our customers, and you're beginning to see the results all across our system." 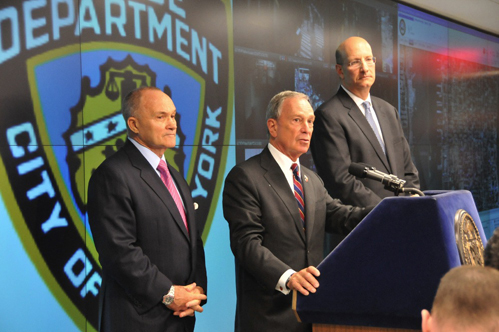 The announcement was made inside the Lower Manhattan Security Coordination Center, where NYPD personnel, MTA and Port Authority security personnel, alongside representatives from the private sector, work together to monitor video feeds and other real-time alerts transmitted to the Center from license plate readers and “911” police activity reports. The Lower Manhattan Security Coordination Center is the central integration point for counterterrorism technology in both Lower and Midtown Manhattan. The Lower and Midtown Manhattan Security Initiatives are funded primarily through federal grants from the Department of Homeland Security.